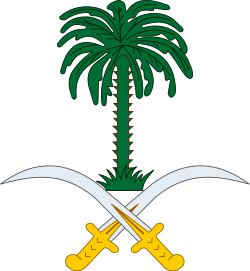 'Asir or 'Aseer /ˈɑːsɪər/ (Arabic: عسير‎‎ ʿAsīr) is a region of Saudi Arabia located in the southwest of the country, named after the tribe of Asir which has the same name. It has an area of 81,000 km² and an estimated population of 2,190,000 It shares a short border with Yemen. Its capital is Abha. Other towns include Khamis Mushayt, Qal'at Bishah and Bareq. The regional governor is Faisal bin Khalid (appointed 16 May 2007), a son of King Khalid bin Abdulaziz. He replaced his cousin, Khalid Al Faisal in the post, who was made governor of Makkah Region on the same day. Geographically, the 'Asir Region is situated on a high plateau that receives more rainfall than the rest of the country and contains the country's highest peaks, which rise to almost 3,000 metres at Jebel Sawdah near Abha. Though data is exceedingly sparse and unreliable, the average annual rainfall in the highlands probably ranges from 300 to 500 millimetres (12 to 20 inches) falling in two rainy seasons, the chief one being in March and April with some rain in the summer. Temperatures are very extreme, with diurnal temperature ranges in the highlands the greatest in the world. It is common for afternoon temperatures to be over 30 °C (85 °F) yet mornings can be extremely frosty and fog can cut visibility to near zero percent. As a result, there is much more natural vegetation in 'Asir than in any other part of Saudi Arabia, with sheltered areas even containing areas of dense coniferous forests, though more exposed ridges still are very dry. 'Asir is home to many farmers who chiefly grow wheat and fruit crops, though irrigation has greatly expanded production in modern times. The population belongs almost entirely to ancient tribes native to the area such as 'Asir, Qahtan, Bariq, Bal-Garn, Elyan, Khatha'm, Bayafandi, Rijal Alma Asir, Rijal Al-Hajr, Amro, Shehr, Shahran, Bal-Asmar, and Bal-Ahmar, (or 'Asaryah), after whom the region was named. Their religion is a majority Sunni Islam of Maliki rite in the main, but also Shafii rite. Zaidi and Ismaili Shia Muslims form the large non-Sunni minority in Asir, becoming the majority in the south bordering on Yemen, but thinning out towards the north. The inhabitants speak a conservative group of Arabic dialects. Most tribes in 'Asir are divided into three sub-parts based on their geographical location. The tribes of the central highlands are called sarat, the tribes of the western coastal plain are called tihama, and the tribes of the eastern desert region of 'Asir are referred to as badiyah. Thus many tribes are divided into sarat, tihama, and badiyah components. The region's culture shares much in common with neighboring Yemen in its architectural style, which is adapted to cope with the occasional heavy downpours by deflecting them from houses, but "[t]he ways of the mountaineers tend towards those of Najd." 'Asir has been much less affected by the oil boom than has the rest of Saudi Arabia, and the modern urban development of cities like Riyadh is largely absent except to some extent in Abha, which serves as a resort town for many Saudis during the extremely hot summers. Tribal laws and customs are still exceedingly strong among the peoples of this region. In 25 B.C. Aelius Gallus marched his legions south from Egypt on a 1,300-mile expedition to take control of the ancient overland trade routes between the Mediterranean and what is now Yemen and Hadhramaut. The Romans wanted control of those routes because they were desperate for money and hoped to raise some by capturing Marib, capital of Yemen, and taking control of the trade in incense - then a priceless commodity - and other valuable aromatics. As it turned out, however, the expedition was a disaster and little information about 'Asir emerged. By 1920, however, 'Abd al-'Aziz, founder of Saudi Arabia, had begun to recoup the losses of the House of Sa'ud and to unify most of the Peninsula under his rule. As part of this campaign, he sent his Bedouin warriors also known as the Ikhwan to occupy 'Asir, and from then on 'Asir was controlled by the House of Sa'ud - a situation formalized in 1934 with the signing of the Treaty of Taif between Saudi Arabia and Yemen. Even then the region was still largely unknown to the West. In 1932, H. St. John Philby, one of the first Europeans to explore and map the Peninsula, did enter 'Asir, but as he did not publish his observations until 1952, the area remained one of the blank spots on the world's map. Historically, 'Asir was known for producing coffee, wheat, alfalfa, barley, senna, and frankincense. Wheat was grown in the summer and sesame has been grown in wetter areas of the region. Straw was used to make mats, hats, and baskets, with specific skills being credited to Somali women in the area. Tribes in the area also weaved tents from straw. ↑ Headley, R.L. "'Asīr." Encyclopaedia of Islam. Edited by: P. Bearman, Th. Bianquis, C.E. Bosworth, E. van Donzel and W.P. Heinrichs. Brill, 2007. ↑ Prothero, G.W. (1920). Arabia. London: H.M. Stationery Office. p. 83. Retrieved 2016-08-15. 1 2 Prothero, G.W. (1920). Arabia. London: H.M. Stationery Office. p. 84. Retrieved 2016-08-15. ↑ Prothero, G.W. (1920). Arabia. London: H.M. Stationery Office. p. 86. Retrieved 2016-08-15. ↑ Prothero, G.W. (1920). Arabia. London: H.M. Stationery Office. p. 85. Retrieved 2016-08-15. ↑ Prothero, G.W. (1920). Arabia. London: H.M. Stationery Office. p. 99. Retrieved 2016-08-15.